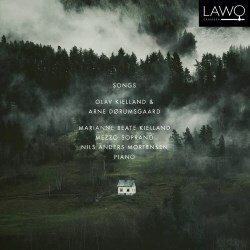 Marianne Beate Kielland and her regular pianist Nils Anders Mortensen are by now well-known interpreters of songs, only weeks ago I reviewed a Mahler disc that was outstanding in every way. Previously they have also tackled Grieg and Mozart successfully – the Mozart was one of my Recordings of the Year 2017 – and also their Norwegian compatriot Catharinus Elling from the generation after Grieg and hardly known outside Norway, but well worth investigating. The two composers on the present disc are no household names either, and Olav Kielland was completely unknown to me. His family name intimates that he is a relation to Marianne Beate, and he is, but only distantly and not her grandfather as some people believe. Olav Kielland was conductor and composer and as conductor he made important contributions to promote contemporary Norwegian composers: Groven, Valen, Saeverud, Tveitt and others. He also had an international career but seems to have been problematic to collaborate with, temperamental and uncompromising and sometimes also difficult to follow when he conducted. An anecdote is illuminating: A musician wrote into his score NB! Dangerous place – don’t look at the conductor! The songs recorded here, which are all the songs by him that have been able to get hold of, span a long period, from the Eichendorff-songs from 1923 (the year of his debut as conductor) up to Tre visur Op. 29 and Vaaren, Op 30 composed in his last year. Olav Kielland had a deep interest in the folk music and folk culture at large in his country. In the 1940s he moved to Telemark, an area where the folk music traditions were very much alive, and this had strong influences on his own music, not least his orchestral compositions. But it is also very evident in much of his vocal writing. The Six Sivle-Songs, Op. 17 are from 1951, when he was already resident in Telemark since ten years. Here the folk tone is very distinct, though handled in a personal way. The piano accompaniments are quite elaborated and sometimes surprising, the harmonic language is also personal with some harsh dissonances, even though his music is basically tonal. In some of the boldest songs I can trace a certain relationship with Geirr Tveitt, and it came as no surprise when I read his bio that he championed Tveitt’s music. The whole suite is fascinating, sometimes simple and melodious, sometimes lively, charming and dancing. It is rhythmically enticing and spicy – and also full of drama. Vaaren (The Last Spring) Op. 30, was his last composition and is deeply moving. Here he sets the same poem by Aasmund Olavsson Vinje as Grieg set about one hundred years earlier. The mood is similar in both settings but Kielland’s is more naked, more vulnerable. The five Obstfelder-songs are also fascinating, though I haven’t been able to find out when they were composed. Nor have I found out the time for Stundom ingen um Elsken veit (tr. 13) It is thrilling and unconventional but again with roots in the folk songs. The first two of Tri visur i vå og von (Three Songs of Doubt and Hope) were written immediately before Vaaren and are related in style, while the third, Gagnløisa (Futility) (tr. 16) to a text by Ivar Aasen, was composed as early as 1946 but included in Op. 29, from almost 40 years later. And it sticks out a lot. It is a “folk song”, but composed by Kielland, and it has all the folk song attributes: catchy melody, simplicity, immediacy. The two hymns Op. 6 are early works. They are simple and beautiful. The second of them, Morgen (tr. 18) is a setting of a text by Thomas Kingo, 17th century Danish bishop and hymn-writer, one of the most important in Scandinavia. It seems that Kielland wanted to create a sense of ancient spirituality in his setting. The third hymn (tr. 19) by an anonymous poet, is very simple and beautiful. The Eichendorff-songs, written by a 22-year-old newly-fledged conductor, are romantic and a bit over-blown in a late Romantic manner, influenced no doubt by his studies in Leipzig. Arne Dørumsgaard is better-known, also internationally, but not primarily as a composer. Born in 1921 he wrote practically his whole oeuvre as a young man during the 1940s. In 1950 he also left Norway in protest against the official treatment of Kirsten Flagstad after the Second World War and lived principally in Paris and Marzio in northern Italy. There he worked on free adaptations of Chinese, Japanese and Korean poetry, which resulted in 25 volumes, issued between 1951 and 1985. For this he was awarded an honorary doctorate of literature by the University of Taipei, Taiwan. He also published 22 volumes of “Early Songs and Arias”, arranged for voice and piano of music from 1250 to 1850. Many of those arrangements have been performed and recorded by Kirsten Flagstad, Teresa Berganza, Axel Schiøtz, Gerard Souzay and others, and I believe that to singers and collectors of vocal music that’s what he is best known for worldwide. But his greatest achievement was his collection of sound recordings of Norwegian music and Norwegian musicians, amassing ca 40,000 78 rpm records, ca 30,000 LPs, ca 10,000 reel-to-reel tape recordings and ca 2,000 cassette recordings and CDs, certainly one of the largest private collections in the world. For all his efforts and achievements he was in 1994 awarded the order of St. Olav, Knight, First Class. His songs, of which there are more than one hundred, are a little hard to classify. Dørumsgaard expert Per Dahl, quoted in the booklet, described them in an obituary: “… a light flowing and imaginative melody line pregnant with rhythm, and harmonies rooted in national trends of the times.” This description fits well to most of the songs on this disc. The three burlesques Op. 13 (tr. 24 – 26) are indeed sly and melodically and rhythmically charming, easy to digest and at the same time the texts provoke thoughts. I liked them very well. Salme (tr. 27) and Et barn (tr. 28) on the other hand inward and contemplative. By snags and by stones. With leafgreen blotches in our mind. With thorns in our bones. Mysterious, obscure, frightening but the music is calm and beautiful. Remarkable ambiguity. Elsewhere the music can be wild and threatening, exhilarating, burlesque – very unpredictable, very special – but all through the suite there is a lot of inventiveness that makes one regret that Dørumsgaard quit composing when he was hardly more than 30. His other fields of activities have overshadowed his compositional work, he has been richly credited for his literary and musicological endeavours; what we hear on the present disc is proof enough that he should in all fairness be credited for his musical endeavours as well, and I really hope that Marianne Beate Kielland’s ambition to record a disc entirely devoted to Dørumsgaard’s songs will come to fruition. Her singing throughout the present disc – just as beautiful and expressive as on all her previous discs – is a further incitement for her adventurous record company to fulfil her wishes and for the record-buying public to invest in this fascinating disc.